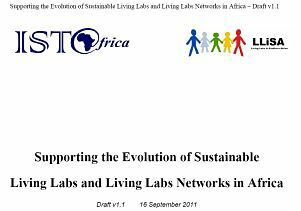 The White Paper, Supporting the Evolution of Sustainable Living Labs and Living Labs Networks in Africa, presents a proposed approach to achieving the sustainable adoption of Living Labs Networks (and Methodologies) across Africa. It is targeted at a range of Key Stakeholders including Researchers, Entrepreneurs, Government Officials, and potential funding agencies. It takes account of lessons learnt from establishing LLiSA in Southern Africa, regional perspectives to ensure cultural and other differences are taken into account, as well as international best practices. (e) better appreciate the enormous potential impact of replicating such activities across Africa.